Whether you’re just starting out and need to learn more, or you’re searching for your monster fish, these tips will make your next trip on the water that much more productive. For some anglers, just getting out on the water is reward enough for time spent fishing. For the rest of us? Well, we’re all chasing a wall hanger. I don’t know many guys who’d turn down the chance to snag a trout worthy of a mount above the fireplace. While we may have more people on the rivers – and maybe fewer fish to go around – we have more knowledge than any generation before us. The men and women who make chasing freshwater fish their livelihood know more now than ever. If you want that trophy fish, the best place to start looking is at a guide’s calendar. The fishing guides here on Guidefitter were kind enough to participate in a survey to help give you the edge you need to up your angling game. Whether you’re just starting out and need to learn more, or you’re searching for your monster fish, these tips will make your next trip on the water that much more productive. 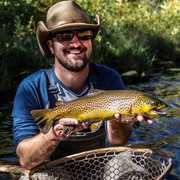 Guidefitter is home to tens of thousands professional guides and outfitters, all eager to share their knowledge, and help you land your dream catch or fulfill that bucket-list hunt. We surveyed our fishing guides in June 2018. The survey was distributed via email, and conducted entirely online. Participation was voluntary, and those who answered weren’t compensated. All numbers cited below represent the percent of the total responses. Which Rod and Reel is Best for Catching Freshwater Fish? If you’ve ever debated the merits of one freshwater fishing approach versus another, we’re happy to finally settle it. According to our guides and outfitters, fly fishing is the most effective method for catching anything that swims in freshwater. Almost half of our respondents indicated the fly rod and reel are their go-to for putting fish in the net year-round. Baitcasters weren’t far behind, finishing as the second-most popular freshwater fishing style. You might initially scoff at these results – after all, what beats a worm, a few sinkers, 10-pound test, and a few cold ones? But consider this: In late May I went to Lake Powell in Southern Utah armed with only a fly rod, and caught tons of bass. A buddy invited me along for early-season smallmouth bass fishing. He’s a stellar angler with a huge collection of spin and baitcasting rigs. I took my fly rod, figuring if I couldn’t get anything on that rig I’d use one of his. My buddy out-fished me the entire trip, which was expected. It was my first time at Powell and my first time fly fishing for bass. I caught more than enough fish to keep me busy for the three days we were at Powell. The fact that fly and baitcasting gear finished so closely in this survey isn’t terribly surprising. What’s the Best Freshwater Fishing Bait? According to the guides, the best bait for freshwater fish isn’t worms. It’s artificial baits, which includes lures and flies. Worms and live bait finished a close second, which makes me wonder if the ol’ reliable worm isn’t as great as I thought, or if fish these days are just smarter. Freshwater fishing is so popular because the challenges it presents are consistent but not replicas of one another. Each river, lake, or pond has its own idiosyncrasies you’ll need to sort out for yourself. The bonus is doing so in some of the world’s prettiest places. Which Time of Year is Best for Freshwater Fishing? “Go early, stay late, and keep your hook in the water!” advises Joby Cefalu, guide for Mile High Fishing in East South Lake Tahoe, California. Cefalu isn’t wrong, but a bit more goes into determining when to fish. The best time of year for fishing depends on many factors: your location, the weather, and the local spawning seasons, to name a few. Overall, most guides say summer is their most productive times of the year in terms of catch rate. So if your goal is to catch a ton of fish, that’s your best bet. For what it’s worth, all my biggest fish have come in early spring or the dead of winter. Granted, I don’t get into 20 or 30 fish days in February like I do in June and July. It all depends on what you’re looking for out of a fishing trip. Where is the Best Fishing Spot? This isn’t the standard, “Where’s hot fishing right now?” question. Instead, we asked our guides where in the water you should focus your angling efforts. We wanted to know what type of structure provides our guides with the most consistent, productive fishing. Not surprisingly, edges were the big favorite, followed closely by deep drop-offs. Which Skill is Most Important for Freshwater Fishing? This is a tough question to answer – one that I’m not sure I have a response for – but what our guides said is enlightening. When asked about the most important skill for freshwater anglers to learn, 41 percent of guides indicated reading water topped their list. “Freshwater fishing is about adapting to conditions and (knowing) the patterns the fish get into at different times of the year,” said Casey Mowers, a guide with Reddog Guide Service in Bowdoinham, Maine. There’s a saying in fly fishing that if you’ve fished one trout river, you’ve fished them all. While that’s not true, it’s not false, either. Each river has its own personality, but once you learn how to read water, that skill translates from the swampy marshes of Florida to steelhead rivers in Washington. Why Use a Fishing Guide? Guides are great for a lot of things. I’ve fished for the better part of two decades, and each time I fish with a guide I’m reminded of how little I actually know about the sport. Guides definitely see part of their value in teaching clients. In fact, 13 percent of respondents said that was the biggest advantage you get when fishing with an experienced guide – but it’s not their most valuable asset. More than half of our guides said an angler’s biggest advantage to fishing with a guide is the guide’s familiarity with and knowledge of local waters. When you think about it, that makes sense. If I’m fishing water I know is extremely technical, or I’ve heard is a real beast unless you’re with someone who’s fished it before, you’d better believe I’m hiring a guide. Looking for more information on guided fishing trips? Connect with a guide, ask a question or follow us on Facebook, Instagram and Twitter. Like what you see? Stay tuned for results from our fly and deep-sea fishing surveys, scheduled to publish later this month. What else would you like to know from our guide network? Let us know in the comments below.